Shirts for all distances except the half marathon were soft cotton instead of technical this year - I didn't mind, as it's a nice design. However we'd selected our sizes based on previous years, so what most of us got was the wrong size. Luckily there were plenty remaining to make an exchange after the race. 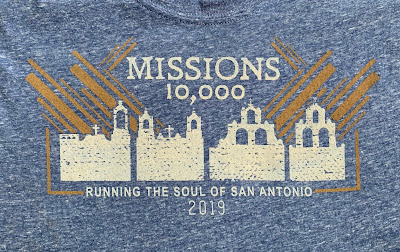 On Saturday, the Renegades finally got to run the Missions Heritage Half/10,000/5K race in San Antonio. The backstory on this race is that it had originally been scheduled for last October but got moved due to a race permit issue with the city...and possibly interference from Rock n Roll race officials, I don't really know but that was the word in their email when the Missions race date was changed. This happened less than three weeks out, but we were able to cancel our hotel reservations and put it on the calendar for 2019. Because we were all kind of tapped out after Houston just a few weeks prior, we decided to not do our usual two-day weekend in San Antonio; instead we'd drive in that morning (a three hour drive) for the race, breakfast afterward, and then drive back home. Yes it would be a long day but hey - the race has always been fun, so it was worth making that kind of effort. 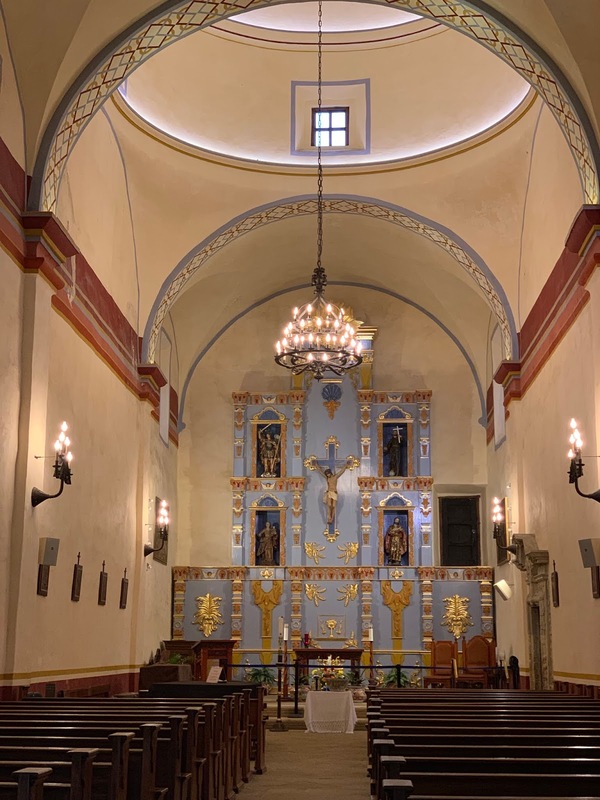 This race is a fundraiser for the restoration of the four missions in San Antonio. Packet pickup was the day before the race in San Antonio and Cary's mom very kindly volunteered to make the hour drive in to get everything for all of us so we wouldn't have to worry about doing race-day packet pickup. On Saturday morning at 3:30 am, Jeff, Karen, Diane, and I drove together toward San Antonio. Cary and her crew had driven to her mom's house the evening before so they'd have an easier time in the morning. Well, best laid plans and all that...we had just hit the outskirts of Austin when Cary called me. Before she said anything I could hear Logan screaming, just screaming, in the background. You guys, this kid is not a crier. This was BAD. Cary said he'd been doing this all night and they were going to take him to the ER as they couldn't figure out what was wrong or get him soothed. 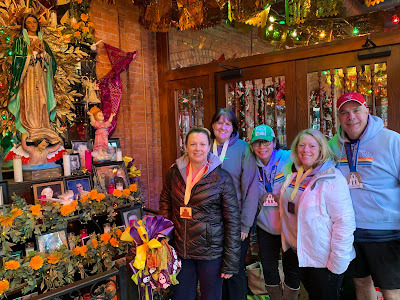 With all of that going on, she was still concerned about us getting our race bibs, and sent us the location of where they were headed, so we went there and waited for them to arrive. Honestly at that point it didn't matter to me if we made it to the race on time - we all were worried about Logan. They pulled in next to us and he was still crying, poor little guy! We got our packets and drove toward San Antonio. We still would make the race, but the weather was giving us pause. 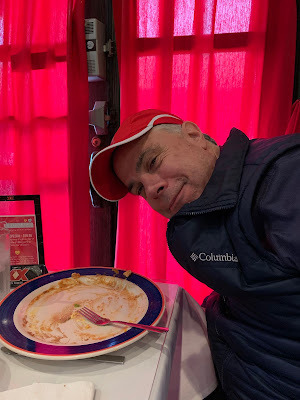 A cold front blew in on Thursday morning - Diane and I ran at 5:45 am when the temperature was 72 degrees and about an hour later it was 38 with a huge wind chill. There was some rain on Thursday, and some sleet and snow flakes, but it was supposed to be less cold by Saturday. Not so...we were checking the radar because there was rain/sleet approaching San Antonio and in fact we could see flakes in the headlights as we drove, but it was supposed to stop by 8:00 am, and the race didn't start until 7:45, so we thought it would be OK. That said, we all agreed that if we got there and it was that cold plus raining, we'd bail on the race (funny thing, when we met up with Julia that morning she said she had the same plan). Diane, Karen, and I were set to run the 10K, while just Jeff and Julia would be running the half marathon since obviously Cary and Brian were busy with Logan. Cary's mom was going to do the 5K with Logan in the stroller; no go on that. We got there and it was just lightly misting, so we soldiered on, getting our winter running gear on, bibs pinned, and we went in search of a restroom. That did not go well - the first one we found only had two stalls and there had to be 30 people in line...and the race was going to start in about 20 minutes. We were told there was a bigger restroom in the visitor's center so we set out looking for that, but never found it. We did get in line at another one but again, too long of a wait so we decided to start the race and look for one along the route - there had to be porta-potties, right? Side note: during our bathroom search, Cary texted that Logan had an ear infection and the pressure popped while they were at the ER and a bunch of gunk ran out of his ear. I cannot imagine that kind of pain as an adult; no wonder he was screaming. But at least we knew he was OK and on his way to feeling better, which was a relief. Back to the race. We lined up in the corral, listened to a few words from Fr. David, sung the National Anthem, and were off - believe me, we were ready to be running because it felt like 28 degrees with a lovely north wind, brrr! Now here's my bad - I hadn't paid a lot of attention to the route because I've run this 10K twice, but apparently they changed it. 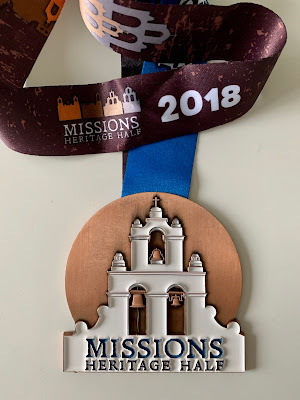 We started at a different mission than in prior years; we were at Mission San Jose, which is where we ran to and got the rose petal shower in the previous races. 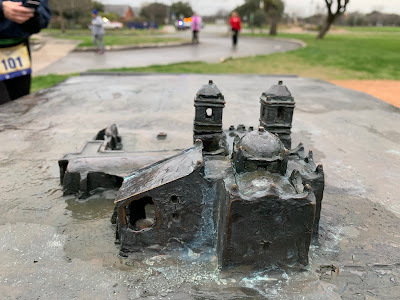 We were running with the crowd, and I kept expecting to make the turn toward the river, where we'd run for a few miles before coming back to the mission. But then we saw runners coming toward us, which was different. We saw Karen so we figured we were doing some sort of out-and-back, but beyond that we had no idea where we were going. All this time, we still had to go to the restroom. I didn't even drink very much on the drive in, but it had been hours since we were awake and the misery was real. 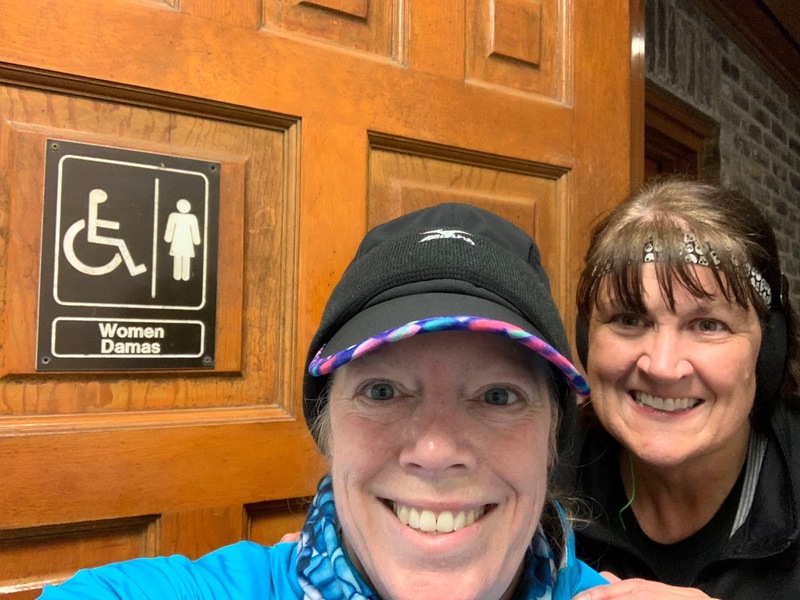 We came across one restroom with a long line of runners at it, so we decided to keep going. We never saw any porta-potties along our route. We ran and just when I was wondering what the heck was up with my dead legs, Diane took out a GU, saying her legs were dead and she needed some energy. At least it was the same for both of us, and it could have been because of the early morning, the long drive, the cold...but we talked and realized that our workouts at BCS Fitness on Thursday afternoon were pretty leg intense. I didn't think about it at the time - I had jumped rope for the first time in at least five years and was pretty proud of myself because I did about 150 jumps, plus we had all kinds of squats and stuff, but yeah, that was a lot on the old legs. So that was probably why we weren't moving very well. 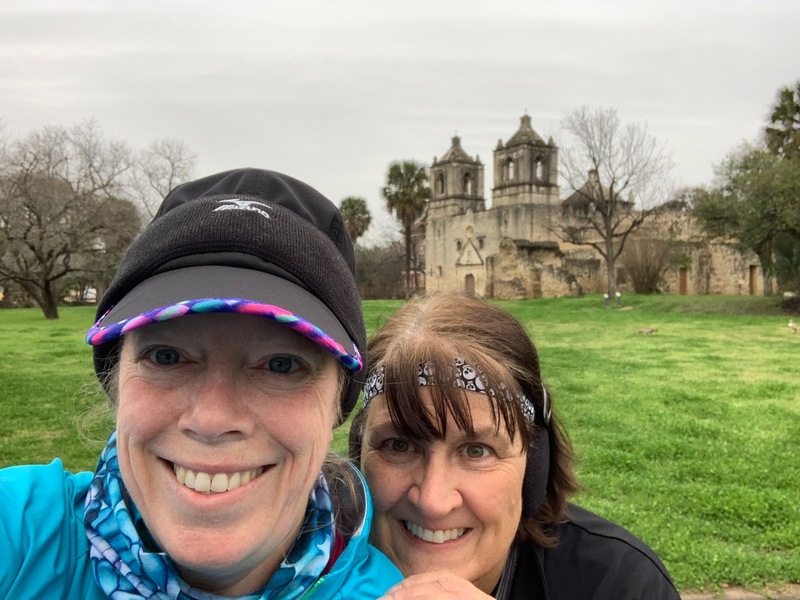 We saw Mission Concepcion ahead and realized that was where the runners were turning around. We ran in and decided to stop for a few pictures, and you know what? That's when the race got fun. Goofing around with Diane, taking a moment to look at the mission - why not? A miniature bronze sculpture of the mission, with runners in background making the turn around. Our personal version of an oasis in a desert! Plus it was heated! Yes we took a selfie at the restroom door. You have no idea how badly we needed this! When we left the restroom, there was no one left on the course except for the police officer who was directing traffic. We didn't spend that much time goofing off, but there wasn't a lot of people running this race and when you're slow, well, that happens. We saw a few people ahead of us, but there weren't any route markers or volunteers out directing, so we followed them until we passed them, and then we hoped we'd see where to go next. The race is not in a great neighborhood and it was a little scary to be there by ourselves; while we've run in that area in the past, normally we pretty quickly make the turn toward the river so we get some distance from that neighborhood. This year we spent more than four miles on it going out and back. We were not entirely paying attention to our intervals, just running when we felt like it and walking when we felt like it, when Diane said that her hamstring was starting to hurt. Ack - I know that pain all too well, so we eased up and ran really slow - no need to aggravate it. 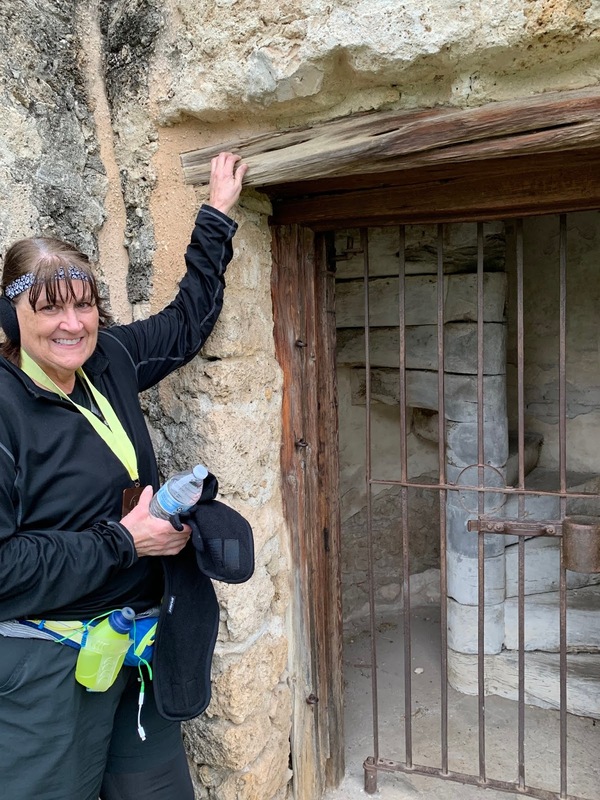 We discussed cutting the race short and just crossing the finish line when we got back to Mission San Jose, and were pretty much on board with that when we made it back inside (it's a huge square courtyard). But...we had no idea where to go - I mean, we could see the finish line but how did we even approach it? We ended up going around the inside perimeter and at one point two runners who were behind us called out asking which way to go - we had no idea. There were no markers, no volunteers guiding anyone, and lots of exits. It was ridiculous and had we actually been trying to run the full race, I would have been really mad. You could see people coming and going from a lot of different directions - we were not the only ones who were confused. We finally saw that you had to loop around the finish line to cross it, so we did that, got our medals, and stopped our Garmins with 4.75 miles done for the day. We had decided that if we cut the race short, we'd run our own 10K at home to "earn" the medal, and later on we discovered we made the right decision, as Karen (who was with a pack of runners so she had a better idea where to go) said the last bit was a steep hill that you had to run up and down, and then turn around and run back up and down it. That would have killed Diane's hamstring - totally not worth it. Speaking of Karen, she placed third in her age group! She never stopped for the restroom and was pretty miserable until after the race was over so I bet that helped her to run extra fast. 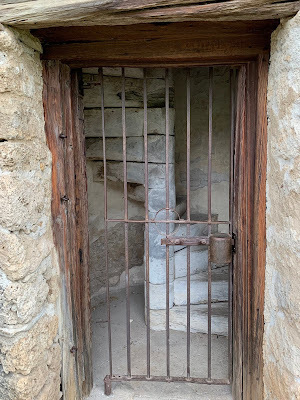 Mission San Jose - exterior. 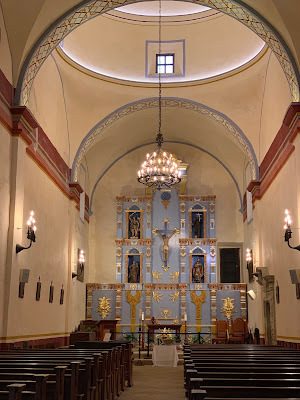 Mission San Jose - interior. The stairs looked like they were made of concrete from a distance, but they are actually weathered wood. The doorway was short - just a little over 6 feet tall - I used Diane for measurement. See? She's an accurate yardstick. It was starting to rain lightly so we headed to the car to get our dry clothing - we were beyond ready to get warm at that point. The organizers had the parish hall open for the post-race food, thankfully - I can't imagine staying outside any longer than we already had to. Once we were changed and had some fruit and yummy Mexican cookies, we checked the race results. Diane placed second in her age group so she went to the timers to have her result removed - she didn't want to deprive someone from an award who actually went the entire distance. I was 14th in my age group so even when I cheat I still can't win, LOL. I was tracking Jeff and Julia and we had a while to wait for them to finish. Meanwhile it started sleeting. This really was miserable weather to be outside in. They finished and Jeff said at one point the sleet was hitting the side of his face and making it so cold that he felt like he had an ice cream headache. Even with the bad conditions, he was pleased with how he felt while running, so it's all good. Yep, he was just a little hungry after running a half marathon in frigid conditions! Wearing layers upon layers - I looked like the Michelin Man and didn't care one bit. Mine. I was disappointed that it wasn't wood like they've done in previous years. The wood medals were beautiful, unique, and in my favorite group of medals. 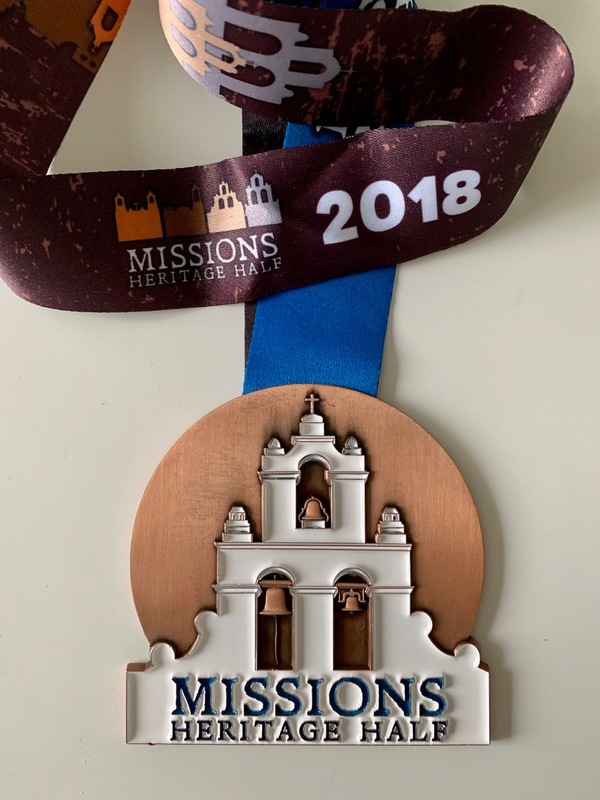 You will also note that the medals says 2018 on it - I figured that might happen because when they cancelled the race so close to the original date, they had to have the medals on hand already, and as this is a fundraiser, it didn't make sense to redo them. Still, I wish they had gone with the wood. Jeff's medal - again with the 2018 ribbon. People were complaining about this on the race's Facebook page and the organizers said that was a mix up and they will be mailing out ribbons with the correct year, but I kinda doubt that will happen. Our medals next to their missions on my shirt. In the days after the race, I've seen several people upset with the lack of guidance on the race course. Some ended up running farther because they didn't know where to turn, and while it was terrible weather for volunteers to be standing outside in, the route could have had arrows, at least, to show the turns. This has been such a sweet race in the previous years; I'm not sure what happened. For something that has been so well-managed over the past several years, it is strange just how badly it fell apart this year. I'm not sure this race is worth the effort to do again next year. I'm the biggest baby when it comes to getting outside in bad weather period doesn't matter what kind be it cold or rainy so I admire your whole group for sticking it out and doing the race. Of course, if your anything like me I want what I pay for! Good job for finishing what you start! I will bail on a run if it's raining and cold, but if I've signed up for a race and we get that weather? Well...that deserves a second thought. 3 hour drive. You guys are hard-core. It's hard for me to imagine that it is cold in Texas but it looked that way. Too bad about the organization. What a nice race. Love the shirts and medals. The best is running a race with friends no matter what the conditions. Oh for sure, being in this adventure with friends made it 1000% more enjoyable than had I been alone. That's the kind of race crap that would turn me straight into a walker and a letter writer. Terrible! As if the weather wasn't enough to deal with already. I'm giving kudos to Diane for telling the race officials to take her out of the age-group standings. I believe that good karma will come back to her for that. It's too bad such a nice race turned into such a discombobulated mess. Would be interesting to see if it hurts their registrations next year. On Saturday they told us that AG awards would be mailed out, which was another reason why Diane told the officials. 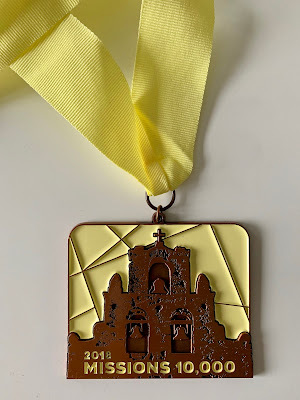 But yesterday Karen, who finally got an AG award in her always-crowded age group, was told by the race director that they couldn't do awards because of the date change...there are some shady shenanigans going on with this race. 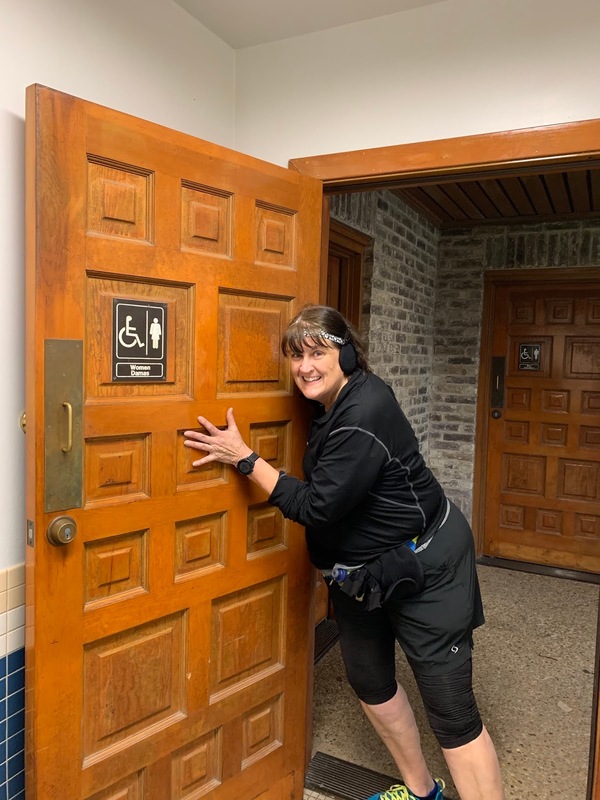 The best part of this report is you guys finding a warm bathroom with no line :) Its a shame it got so discombobulated (love Helen's word) Maybe you'll hear why and next year it will be back to normal. I love your San Antonio reports. Poor Logan. My little brother used to get those ear infections. I've never had one, but they are supposed to be terribly painful. Heck yes, the warm bathroom/no line was so amazing! Aww man, poor Logan. I am so glad they took him in and it drained and he felt better. My snis just told me her son (age 2) has an ear infection and they are waiting for it to drain... eek! Man, this race was a cluster this year WTF! Messed up course, cotton tees, metal medals. Ugh. And that cold rain NO gracias. The highlight seems to be finding the bathroom and lunch after! I hope they get it together for next year! Cluster of a race is correct. Poor Logan = ear infections are so incredibly painful when they get to that point. It's a shame the race turned out so poorly. How weird for an established race, but maybe having to change the date just threw everything into a tizzy they couldn't recover from. I don't know...they had several months to regroup. I know I'm not sounding very forgiving, but we are seeing through some outright lies and it's pretty dumb. Even with the issues in the race...it sounds like you had fun! As a side note..thanks for letting us know early what was up with Logan. I love race reports but was ready to scroll down and skip it all to find out what was up with the renegade toddler!!!! Believe me, we all were glad to hear that he was going to be ok before we started the race - it was worrisome for sure! It's funny how excited you guys were to find a bathroom! After my first half marathon a few weeks ago, the first thing I wanted was some water, and the second thing was a bathroom. Hopefully the race directors learn from this year and are better organized next year. Sometimes the basics of life become realllllly important! 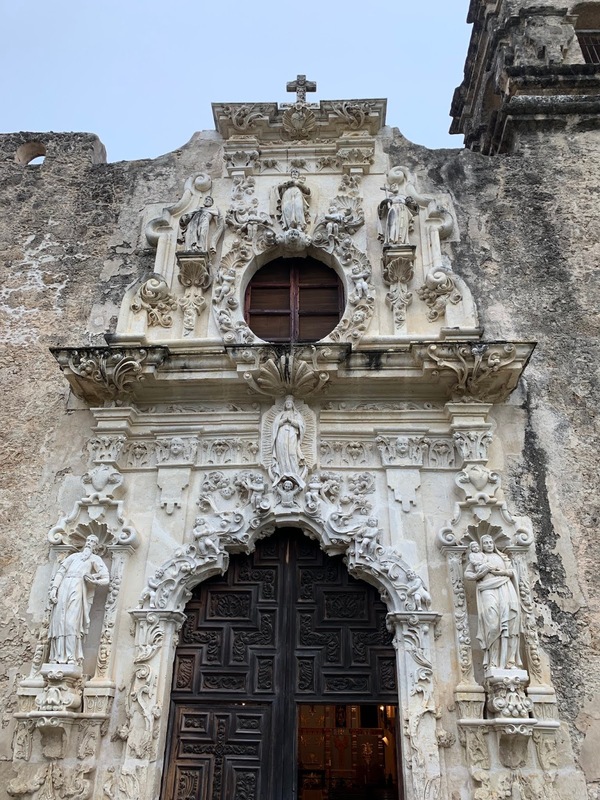 Mike and I saw all the missions on our trip to SA years ago. 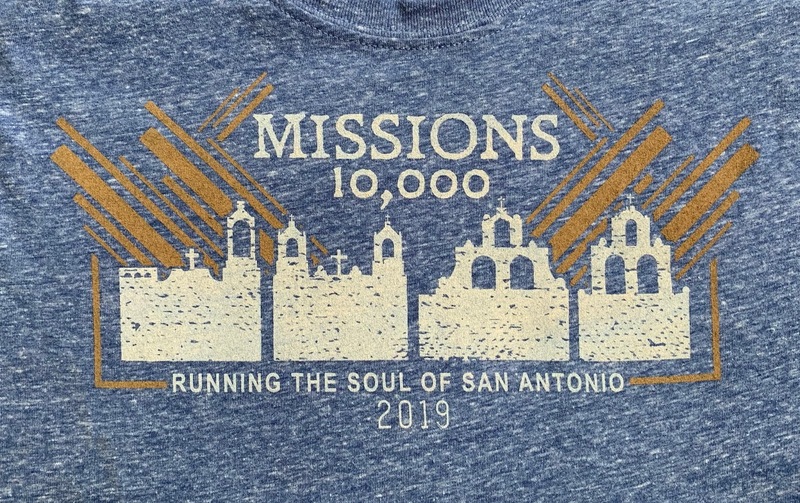 I thought there were 5 missions, including the Alamo? I always said I'd love to run a race that hits all the missions but this sounds like it was a cluster! I wonder what happened. Maybe next year will be more organized. 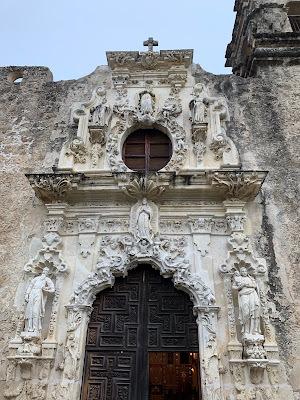 The Alamo makes the fifth mission, but it has a separate entity who manages and does upkeep, so the other four were left to crumble over the years. I'm really glad to see them getting some attention.